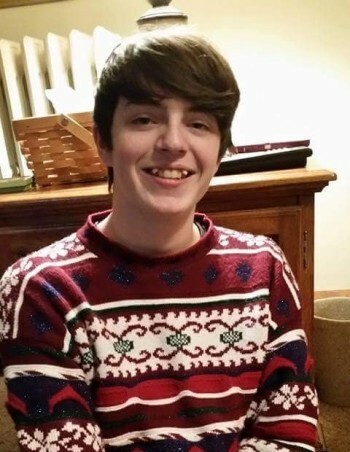 Daniel Hurley, 17, of Roscoe, passed away on Saturday, September 8, 2018. From a very young age Daniel Ryan Hurley had an affliction for intricacies. Beginning with his love and passion for trains, he would especially obsess over locomotives. Little Danny boy could tell you everything about a passing train, including where it was heading and where it came from. His fascination ran deep! Danny was dedicated to certain causes through his brief time here on earth. Most of which needed and still need all the support and acknowledgment they can receive. He was a fighter and visionary for those who had no voice. His leadership skills were unbeknownst to any 17 year old. A testament to this can be recognized by his role as president for the Cinematic’s Club at Hononegah High School. He grew the club membership size dramatically, but more importantly expanded the minds of the young influencers to love and appreciate the art of film. He had aspirations of top film schools and directors alike. Hosting a movie-night every Friday, he gave the weekend a welcomed revitalization. Danny Hurley was intentional and straight to the point. He lived life without the fear of rejection or judgment. He saw the good in others and always brought a smile to the faces of those he encountered. Life was exciting and punny when you were hanging with Danny. Unique in his own way there were certain hobbies you could always find Danny engaged in. From fidgeting with calculators and configuring math calculations to plotting the most ridiculous memes; Danny had a knack for finding the perfect solution or punchline. When he wasn’t scheming up shenanigans with his closest friends and family he would dedicate his time to music. Danny loved music! He appreciated all genres, but there was a special place in his heart for TRANCE. You could find him everyday after school at his computer-rig working on his latest song. Danny would spend hours upon hours producing one very, very long song. That is what he loved the most. When he received royalties amounting to a couple cents for one of his releases he felt like the wealthiest man on the planet. Daniel Ryan Hurley was rich with love and support. His network expanded beyond just family and friends. He touched lives of others without even knowing. His legacy will run on with the “Dr. Dan Hurley” Memorial / Endowment Fund, awarded as a scholarship to those studying Film at UW Madison. His life-long dream was to become a college professor of film history with an emphasis in film theory. His day was well-spent when he had achieved a new high-score on Dance Dance Revolution, battled his brother in ping-pong, pet a friendly pooch, or stuffed his face with some Shogun sushi. He found joy in the little things and that is what made him such a delight to be around. Danny was well-spoken, always remembering to express his appreciation and gratitude, but never forgetting to correct someone’s grammar. During his finals hours he spoke about three key factors to his life. 1) The love of his mother. 2) The friends he kept. 3) Good music “like Sun-catcher”. Memories such as these are what keeps him in our hearts. The love runs deep for this selfless soul, Danny Hurley. Visitation will be from 3:00 to 8:00pm on Thursday, September 13, 2018 with a time of sharing at 6:30 p.m. in Central Christian Church, 2460 Milwaukee Road, Beloit, WI 53511.